We are moving smoothly into 2019 with a two-pronged meeting next Wednesday. We will start with an optional 4 PM session, in which we are fortunate to have ASHRAE Society Vice President and Distinguished Lecturer Julia Keen. She will be available to discuss the challenges associated with maintaining productivity and profit for businesses. She can also offer unique insights based on her perspectives as a successful woman in the industry, as a consultant, in academia, and as a national level officer in ASHRAE. We will then give Julia a break while Tim Parbs presents an introductory technical session on steam piping. After dinner Julia will present on opportunities to improve employee satisfaction and company profit. Annual CTTC award nominations are due soon. Reach out to Committee Chair James VanderZanden at CTTC@ashraemadison.org for details. REGISTRATION CLOSES AT NOON ON MONDAY, JANUARY 7TH! Technical Session - 5 pm (optional) - Tim Parbs Steam 101 - Black Magic and Myths about Steam Piping in today's HVAC world. Tim Parbs is the president of Badger Thermal Unlimited LLC, a manufacturer's rep/distributer serving Wisconsin and surrounding areas. He is also a principal with Advanced Steam Technology Co. LLC, a manufacturer of ultra-high efficiency steam heating equipment. He has over 30 years of experience working with steam systems. His areas of focus are process improvement, safety and energy savings. He works with all types of facilities including commercial, industrial, institutional, power plants, food & beverage, chemical and paper mills. He provides technical assistance and training, as well as field surveys and steam energy audits. He also conducts frequent Steam Energy Seminars in a glass-piped demo room. Tim is an associate member of ASHRAE. As the building design and construction industry looks at the composition of the future workforce it is clear that the demographics of today will need to change to meet future demand for employees. It is projected that this change will include increasing the number of women employed in the building design and construction industry. We have seen an increase in young women enrolling in STEM disciplines at the university level and an improvement in the numbers attaining college degrees, but we have not seen the same increase in the percent of women employed in the STEM workforce. This inconsistency can be attributed to poor retention of women once they enter the profession. This presentation will address why women leave the industry and what can be done to help increase retention. This is an important topic for our industry as a whole as well as for employers trying to minimize turn-over and maximize productivity and profit. Julia Keen is a Professor of Architectural Engineering and Construction Science at Kansas State University holding the Bob and Betty Tointon Engineering endowed chair. She also owns her own consulting company, Keen Designs, PA. Her specific areas of interest include HVAC design, energy codes, high performance design, HVAC education, and the advancement of women in the building design and construction industry. Julia Keen received her Bachelor’s Degree in Architectural Engineering from Kansas State University. Upon graduation, she worked as a Mechanical/Electrical Project Engineer in Waterloo, Iowa. In this capacity she was responsible for the design of building systems from initial planning stages through final project inspection and completion. Julia was involved in new and retrofit projects including hospitals, health clinics, assisted-living and nursing facilities, education facilities, office buildings, retail facilities, dormitories, and churches. In July 2003, Julia accepted a faculty position with K-State in the Architectural Engineering and Construction Science Department. She completed her Master’s degree in Architectural Engineering (2005) and her Doctorate (2010) in Education both from K-State. She is a Licensed Mechanical Professional Engineer in Kansas and Iowa and holds two ASHRAE Certifications - High-Performance Building Design Professional (HBDP) and Building Energy Audit Professional (BEAP). Actively involved in the fundamental education of the refrigeration community in the development of load calculations for low temperature building environments. While it may seem early, now is a good time to start thinking about the annual ASHRAE Technology Awards. Established in 1990–1991, the Technology Awards Program applies to new and retrofit applications in seven categories: Commercial Buildings, Institutional Buildings, Health Care Facilities, Industrial Facilities or Processes, Public Assembly, Residential and Alternative or Renewable Energy Use, with separate categories for New and Existing Buildings. Award applications are judged with respect to energy efficiency; indoor air quality, innovation, operation and maintenance, cost effectiveness, environmental impact and quality of presentation. Last year we were able to send two projects to the regional level, where they were awarded in their category. We hope to see some great submissions again this year, so think of a great project you've done recently! (Note that projects should have a full year of energy usage data by September of 2019.) Winners will be announced for our chapter level at the April meeting. Winners will be sent on to the regional level to compete against other chapters, as several Madison entries did last year. To me ASHRAE is an organization of members dedicated to the “sharing” of our knowledge for the benefit of all. Sharing is both receiving and giving. We all receive the benefits from the ASHRAE handbooks, The ASHRAE Journal, the newsletters, the meetings, and conferences sponsored by ASHRAE. But what about the giving back? Someone has to give in order for us to receive. Someone has to plan the meetings, organize the conferences, write the papers, and raise the money for research. I felt a need to give back and share my knowledge. Being an active participant in ASHRAE is one way I could give back. Going through the Board of Governors and the chairs gave me a chance to give back. I learned more about ASHRAE, felt good about planning and executing the chapter meetings, felt good about raising money for research and scholarships, and had the chance to interact with other board members and with other chapters at the CRCs. I am proud to have served you and would recommend to all of you to find your way to give back. We would also like to thank our local contractors and vendors, without their support this fund raiser would not have been possible. Interested in what research is currently taking place and it's status? Follow this link for the abstracts of the current ASHRAE research. If you have questions about Research Promotion please don't hesitate to reach out directly me. Our Region VI of ASHRAE's international Society, will host a dinner on Sunday, January 13th in Atlanta to meet our peer volunteers of our Region and will join Region VI (just east of us). We will dine at Park Bar, which is adjacent to Centenntial Park. Please plan to join us. The dinner is $55 which includes a the complete meal, excluding alcohol. You can pay on-line through Region VI Dinner. You may sign up on a Google Sheet and pay later. 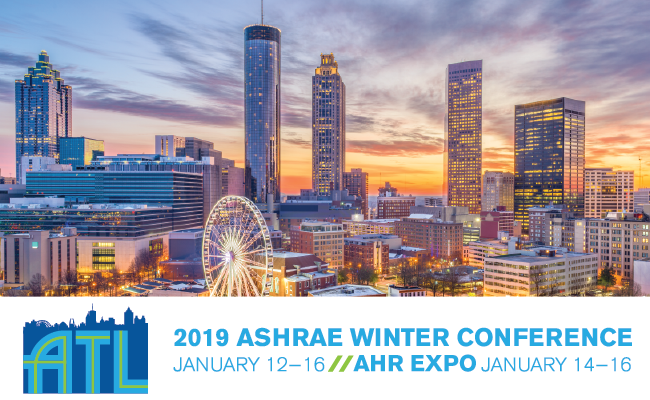 We hope you enjoyed the 2018 ASHRAE Winter Conference in Chicago, and plan to attend the 2019 ASHRAE Winter Conference & AHR Expo in Atlanta this January. You can expect the same high quality technical program, fun and informative tours, social events and more, all with a side of Southern hospitality! The AHR Expo and conference technical sessions both take place at the Georgia World Congress Center, a short walk from the Omni Atlanta Hotel at CNN Center. The Conference Keynote Speaker, Grant Imahara, was one of the hosts of Discovery Channel's MythBusters for almost a decade, and will be speaking at the Saturday Plenary Session. 5 New ALI Courses are available and can be added to your conference registration. New courses include Advanced Designs for Net Zero Buildings, Choosing the Right Energy Code for your Project—IECC 2018 or ASHRAE 90.1-2016, and more. See what's planned for 2019, and register by October 28 to take advantage of early bird rates. We'll see you in Atlanta! ATLANTA (Dec. 18, 2018) – ASHRAE has released an updated edition of ANSI/ASHRAE/IES Standard 90.2-2018 Energy-Efficient Design of Low Rise Residential Buildings.